Daydreams of Quilts: Happy New Year! Happy New Year! I didn't get as much quilting done in 2012 as I would have liked but still accomplished a few. Now that I have quit my part time job that was becomming more and more like a full time job I have a bit more time. 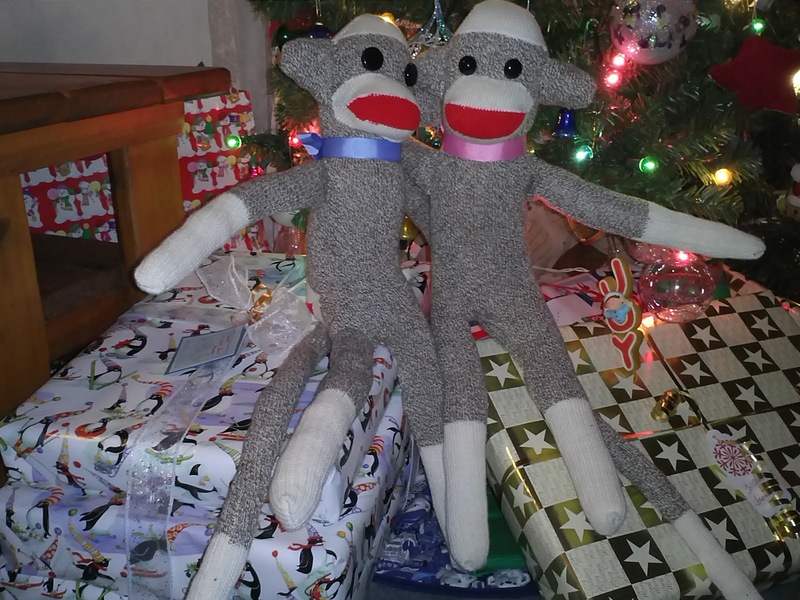 I completed a couple of last minute projects for Christmas gifts in the days before the big day. 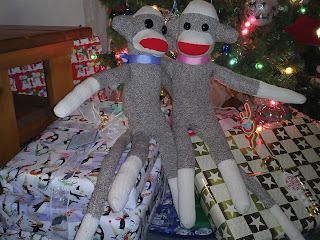 One project was these little sock monkeys for my two kids. 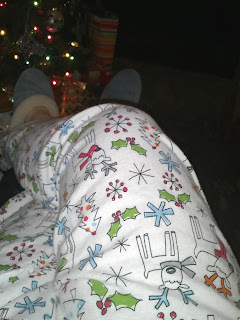 I also sewed three pairs of flannel pajama pants. One for my sister, one for my brother and one for me! These are super comfy so I plan to make more in 2013. I knitted a ruffle pom pom scarf for my Mom but didn't take a photo of it. It was wrapped right after it was finished. I finished knitting a dish cloth and started another so I am slowly getting my stash of yarn used up and my stash of dish cloths stocked up. We had a suprise basement renovation at the end of November/beginning of December. Our landlords decided to insulate and drywall our basement. We had to move a lot of stuff out in not a lot of time which was very stressful. All my crafting supplies are in the basement so it was no small task. But now that it's over we have a warmer house and everything is very well organized. I went through it all and have refreshed my memory of what I have down there and reminded myself of projects I want to finish. So I hope 2013 will be a productive year that uses up a lot of my supplies. I hope 2013 is a good year for everyone. Thanks for stopping by.